Scroggin has always been an integral part of Mike’s outdoors life and it calls up memories of long days on the trail and fleeting restful mid-crag moments. Here he digs deep into a bag of (sometimes unidentifiable) deliciousness and comes up with a handful of the history and science behind every adventurers favourite snack. 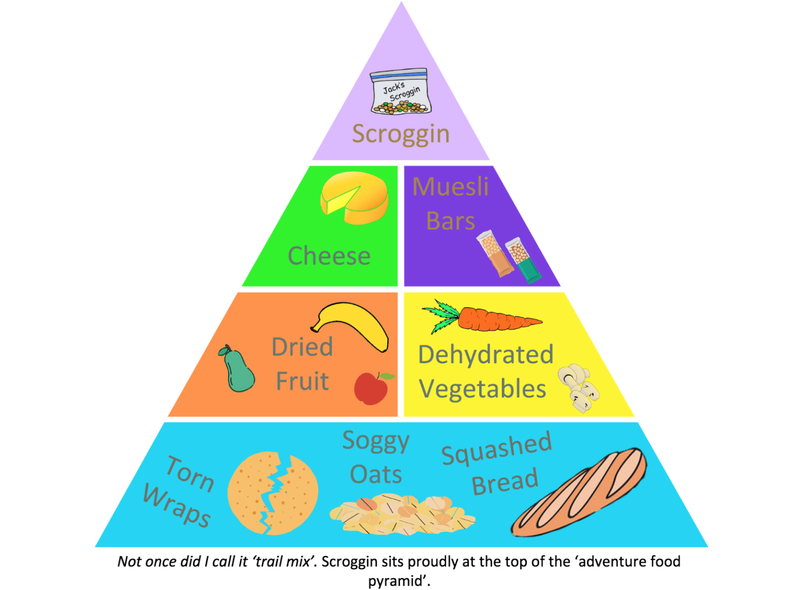 I grew up believing that scroggin was an essential food group, at the top of the pyramid, that must be consumed every day whilst hiking. The eclectic mixture of over-sweetened, home-brand lollies and excessively salty mixed nuts combines with runny melted chocolate when you leave it in the top of your pack — it’s a dish to be desired. Yet as time goes on, the term “trail mix” has been infiltrating the outdoor scene, floating around with increasing frequency. What Do You Call Trail Mix…When You’re Not On A Trail? 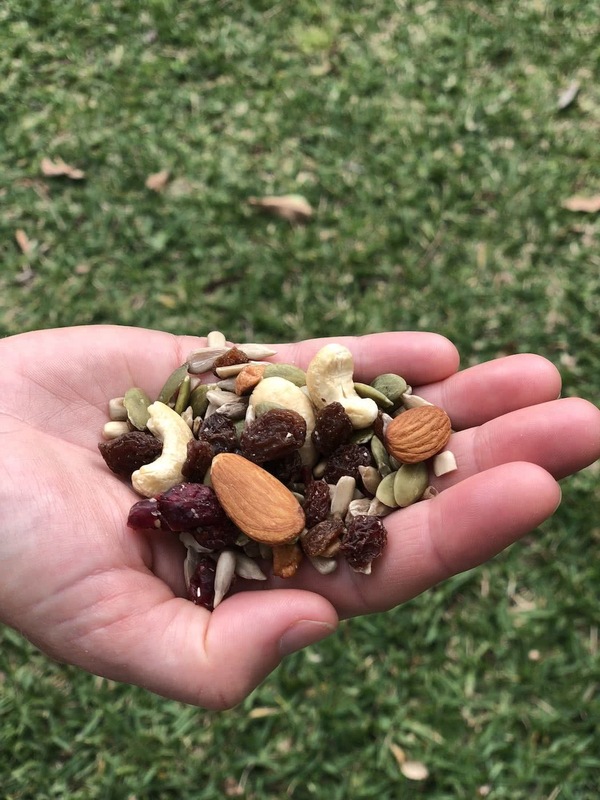 Trail mix might be what goes in kids’ lunchboxes, or what sits on workaholics’ desks to fuel endless spreadsheet faffery. But it’s scroggin that goes on adventures. It’s scroggin that bulges from your pockets while hiking. It’s scroggin as a quick snack on the belay ledge, the summit and trailforks. But most importantly, it’s scroggin that tastes good. With a name almost as exciting as spondonicles, our tramping friends across the ditch have attempted to claim a Kiwi origin to scroggin dating back to the 1940’s. Yet the same is claimed by old Aussie bushwalkers. Regardless of who invented it, scroggin is the perfect snack at all times on a journey (and for 3 days after…as you made too much…again). It’s become a staple, easy to make, high-energy adventure food that lets you get away with ill-prepared meal plans on multi-day expeditions. As much as it sounds like it, scroggin might not actually be a describing the chunky leftovers in the sink after all — S.C.R.O.G.G.I.N is an acronym. But, as scroggin is 110% better than any other food group, throw in another handful or two of whatever you like. Chop everything to a similar size so it mixes well together — as sultanas and nuts will make up most of the mix, chop to this size, or find items such as chocolate cooking buttons that will mix well. Don’t be afraid to mix up the dried fruit. Dried apricots, apples, cranberries and coconut flakes work well too. Scroggin is a high-sugar, moderate-fat food with a bit of protein. Roasted peanuts are a good choice as they contain 40% fat and 26% protein, while other nuts contain up to 50% more fat and less protein. If you have leftovers, mix them in with a tub of vanilla ice cream when you get home! Mike’s been wearing outdoor clothes for so long he thinks jeans are formal. Getting outside is a distraction from his Environmental Geochemistry studies, yet a recent relocation to the Blue Mountains is set to fuel his adventure filled lifestyle. Mike gets off on climbing choss, hitting the trail on his pushy and basically anything away from the big smoke.